Camera Gear – what worked, what didn’t? The hardest part of getting ready for this trip was selecting the camera gear. I could not find enough online about what to bring and what to leave at home, so let me give you a hand. If you click on the Gear-Up page, you can see what I had to choose from. Rikki and Jack Swenson talked me into bringing my 300mm f2.8L IS lens, and I knew I wanted to bring 2 camera bodies. This was the foundation for what bag I was going to pack things into and build off of. I took a Canon 1DMKII, a Canon 1Ds, and a Canon SD550 Point & Shoot. The 1DMKII got most of the use as the 1Ds sucked more battery down when we got into the freezing temperatures. I used the 1DMKII on every excursion and loved it! I only had to change batteries once per 1,000+ image excursion. The 1Ds stayed on the boat and served as a fantastic body for shooting landscapes from the ship with a 70-200mm lens (the 1Ds is full frame). My better landscapes were shot with the 1Ds. The 1DMKII’s shutter started to hang at the end of the trip. I assume it got some salt water in it from shooting on the deck of the ship and not using a weather-sealed lens. This was the only camera mishap of the entire trip. I highly recommend taking two camera bodies at a minimum. Not only for backup purposes, but there are times you’ll want to have one camera with a long lens attached and another camera with a wider lens on. Yes, there are plenty of opportunities that warrant running around with two cameras. Take a small point and shoot as well. I liked having it in my pocket while we were on planes and buses. I took the 3 lenses that are my mainstay arsenal: Canon 24-105mm f4L IS, Canon 70-200mm f2.8L IS, and the Canon 300mm f2.8L IS plus 1.4 & 2.0x teleconverters. I never once felt my range was not wide or long enough. 300mm, in my opinion, is the perfect length for many shots on South Georgia. I seldomly used the 1.4x TC and never used the 2.0x TC. The 24-105mm didn’t get as much use as I thought it would. When I go back (notice I didn’t say “if”) I will use a wide lens more often. Most landscapes were shot from the boat with the 70-200mm on the 1Ds while on-shore excursions were mainly reserved for telephoto time with the animals. Take 2 gallon plastic bags. They sure are handy for peace of mind when you individually place each piece of camera gear into its own bag and then put it inside your camera bag. Also have a roll of duct tape in case it starts to rain so you can put bags together as rain covers….or take a specific rain cover with you. The plastic bags pack small and have numerous uses. I took a thinkTANK Airport Acceleration which was incredible! thinkTANK is the Gitzo of camera bags. Everything fit and even when I had to check it (long, bad story) I wasn’t too concerned. The internal padding is fantastic and I had no issues. In fact, I voluntarily checked it on the way back home. It went through one nasty, and sudden, storm on Sea Lion Island in the Falklands where we had rain, sleet, snow and hail all in the same hour. I got caught in the storm about a mile or two from any cover. I managed to find a sand dune to duck behind while the rain was sideways where I could pack my gear a little better. The rain cover did its job, but the outside of the bag got a bit wet while I was using the rain cover to protect a camera and lens. No water got through. I didn’t realize how many short excursions we’d take where the big backpack was just too much. I picked up a Tamrac Velocity 9x while in Santiago. It was the only camera bag around that was big enough to hold what I needed it to hold. I’m not a fan of sling bags when carrying over 10lbs of gear because the shoulder strap digs into your shoulder after a while. It got the job done though. I have a full bag solution that should alleviate all future trips like this – works just like keeping warm: layers…explanation in the conclusion. Yep, this is definitely something to put some thought into. If you’ve never used more than 2 batteries in a day of shooting, take 4. I took 5 and used all 5 up more than once. It isn’t because the cameras are sucking power, it is because there will be days when you’re rushing back to the zodiac to be the last on the ship, grabbing a 2 minute shower, running to dinner, then getting back to your room with zero energy and crashing. Recharging camera batteries becomes a low priority when you need to recharge your own body. When we crossed the Antarctic Converge the temperatures dropped substantially. You’ll want an extra battery or two close to your body, so think about having a jacket with pockets that will allow you to comfortably carry extra batteries….and a hat….and gloves….and a gaiter…..and anything that will help keep you warm too. I experienced premature battery drain due to cold, but upon warming the battery back up the charge was back. This happened often and other passengers went through this as well. I took 32GB’s worth of memory cards. Between an 8 megapixel camera and a 11.1 megapixel camera this was overkill. When I used a shipmate’s Canon 50D (15 mega pixels) I went through an 8GB card like it was a glass of water. One passenger only brought a single 8GB card for her 1DsMKIII (21.1 mega pixels) and was having to be very cautious not to get too carried away. I lent a memory card from time to time because people didn’t have enough or forgot to offload a card from the day before (happened a lot). Before this trip the most I ever shot was 14GB’s in a day. I was averaging that on this trip. I think 20GB’s would have been the right number for the cameras I had, but when I upgrade it will not be enough. You want to have enough room to shoot at least 2,000 photos per day (or 1,000 photos per excursion). Do the math on what that equates to on your camera. I took my 430ex flash and used it once. I just forgot about it. I would have liked to have used it more often, and will next time. I also took a Better Beamer, but I never used it because I was so worried it was going to blow off. Wind is a huge factor in that part of the world. I used my tripod often. It is just as important as a lens. However, some of the pros with Nikon D3 bodies didn’t take tripods and compensated with high ISO. I don’t think I can give up the creative motion shots that just can’t be done without a tripod. I plan to buy a smaller Gitzo travel tripod and will probably take a monopod for shooting off the ship next time. When shooting whales and Wandering Albatross (special instances) off the ship, the weight of a super telephoto starts to wear your arm down after a few minutes. Imagine holding almost 10lbs of camera and lens to your eye for 30 minutes straight – no thank you….not doing that again! I bought some really nice and compact binoculars and only used them to look out the window of my cabin. Any other time I had my camera with me, so I didn’t need them. If you’ve got a camera with a telephoto lens, don’t take the binoculars. What will I do differently – a few things! I am actually planning on changing a lot of things with my current gear lineup. First off, I am completely sold on more mega pixels, lighter weight, higher ISO performance, bigger screens and the new Canon image sensors. I think I am going to pick up a Canon 50D and Canon 5DMKII. I will miss the 45-point focusing of the 1 Series and 8 FPS, but I won’t miss the weight, battery charger, or batteries that come with it. Besides, I haven’t used the full 45 point auto focus in over a year. I have better results shooting with a single point. Now that I’m post processing on a real computer, I’m finding I want bigger prints. Without up-sizing, I can print up to 16 x 24 inches off the 1DMKII images at 240 DPI. The 50D can get over 30 inches at 300 DPI right out of the camera. Carrying 40lbs of gear around gets old after a few hours. I want to lighten the load. So, moving to smaller cameras makes more sense….financially as well! I mentioned earlier that I have an idea for bags. Yep, I plan to use a LowePro Flipside 300 for short trips with only a single camera body and two lenses and then get a thinkTANK Glass Taxi if I ever get the Canon 500mm f4L IS I want. I’ll pair these bags with the thinkTANK Belly Dancer and a modular system around my waist. This is a better distribution of the weight and can be attached to a single backpack to act as a carry-on item. If the airlines starts to give you hell about the weight or size, then you take it apart, put the belt on your body, then put the lenses on the belt so it is technically like “clothing”….no rules for that! This modular system also makes it so you don’t have to put your gear on the ground. In South Georgia there is a lot of wind and changing lenses can get somewhat harry. On top of that, you can change lenses, batteries, cards, flashes, filters faster! With the smaller gear and modular bag system, the only other thing I’d get is a dry bag. Something to put everything into if the weather turns. The dry bag would have to be somewhat small and attach to the outside of either the Flipside or Glass Taxi. Enjoyed your posts on Antarctica. 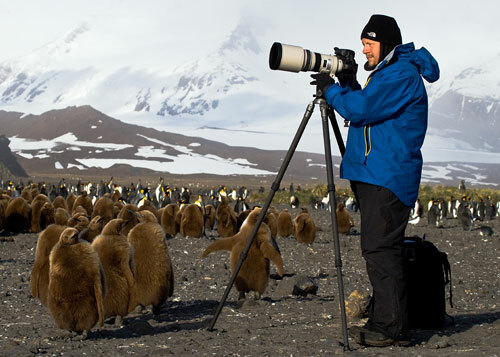 As I am leaving on a Lindblad expedition to Ant, SG and F (Feb 9), and have a backpack full of cameras and lenses, I am curious about your “long, bad story” when you had to check your gear. Was that on the LAN Chile charter flight from Santiago to Ushuaia ? I would appreciate any other tips on avoiding trouble from overzealous baggage cops. Now that I am responding to you only 2 months after you left your comment, I have to ask – how was the trip? 5 years later and I’ve done the 50D body and decided against the 5D in that process. I’m back to the 1D bodies again. I am too big a fan of the incredibly quick autofocus the 1D delivers. Think Tank is my primary supplier of camera bags. I’m thinking a Galapagos trip (aboard the National Geographic Endeavor again) is in the making and in preparation for that I have finally invested in the Think Tank modular system….why I didn’t do this earlier is beyond me. The customization capabilities of the belt and backpack systems makes preparation for any destination incredible. I also enjoy the weight distribution capabilities through these customizations. I’m still loving the 24-105mm f4L, 70-200mm f2.8L IS Mark 1, and 300mm f2.8L IS Mark 1. I’ve added the amazing 85mm f1.2L and 180mm f3.5L in the last 5 years and been extremely happy with this combination. The only other lenses I yearn for are the 24mm f1.4L and 500mm f4L IS Mark 2. However, I’d have to think long and hard about whether I want to drag that 500mm on a plane. Without question the 500mm would have been more trouble than it’s worth the way I experienced South Georgia Island and the Falklands.